Buckland Manor, in the heart of England's Gloucestershire country. Buckland Manor, dining in the heart of England's Gloucestershire country. For a memorable dining experience, we were directed to visit the nearby Buckland Manor, which is located in the heart of England's Gloucestershire country. There, we were told, we would find excellent food along with the unique experience of dining surrounded by the many centuries of history and furnishings of the Manor house. As we turned down the long, fenced drive leading to the Manor, the landscaping and gardens were perfect -- even to the nuance of them hiring several wild rabbits to hop around on the grass, which looked as though it had been trimmed with scissors. Few country house hotels can trace their origins as far back as Buckland Manor. The first written record of a house on the site of the present hotel stretches back to the seventh century AD, further even than the history of England as a united nation. In an attempt to impart a feeling of the antiquity of the place, following is a brief history of what is known about the Buckland property, along with some photos of the interior. In 600 AD, the manor house was mentioned in the records of Gloucester Abbey when the Abbot received it as a gift from Kynred, the ruler of Mercia and chief king of the seven kingdoms of the English nation. Those distant origins of the manor are known today because the title to the land (unusual for the Dark Ages), was inscribed in a book. Over time, the Old English name, 'Bookland,' became corrupted to 'Buckland,' the present name of the village. In the Domesday book the estate was reckoned to be worth £9. The house stayed in the keeping of Gloucester Abbey until 1536 when the Dissolution of the Monasteries occurred, and the land passed into the possession of the Gresham family. Two famous sons of this family rose to become Lords Mayor of London. The Greshams finally exchanged the estate for property in Yorkshire and it subsequently passed by marriage to the Thynne family (family name of the Marquises of Bath) whose relation, Colonel Bernard Granville, lived in the house with his family from 1715. Buckland estate was sold again in 1802 and has been owned by four private families since then, prior to its conversion to a luxury hotel. 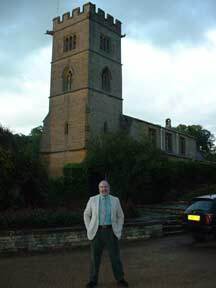 Standing close by the hotel/manor house is the church you see me posing in front of. This building dates from the 13th century when the original manor house was built. It contains an array of memorabilia of the Thynnes and Granvilles, as well as some recently discovered unique ceiling paintings of national importance. Before we went inside to eat, I had Malcolm and Wendy stand in front for a photo. You can see just a small portion of the many blooming flowers on the estate. Once inside, it was as though time had reversed itself. Most everything in view, with the exception of the people working there, was obviously hundreds of years old. A fire was laid in the huge fireplace in the sitting area, where we were brought an initial round of appetizers and wine, and invited to view menus. Other diners were relaxing in several different sitting rooms prior to entering the main dining area. In my somewhat limited experience with eating at places with big reputations and high prices, the food itself was not always particularly good. But for us, Buckland Manor proved an exception to my other experiences. 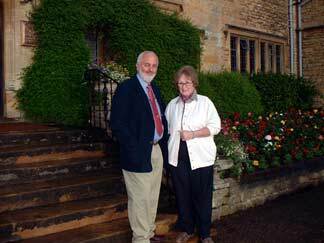 From the hostess who opened the door for us when we arrived, to the final farewells -- and including all the wonderful food we enjoyed in between -- our dining and cultural experience at Buckland Manor is one I'll long remember. And, just think of the bank account you'd have if you had just one farthing for every person who's stood by this particular loo!